GAT-3 antibody LS-C15302 is an unconjugated rabbit polyclonal antibody to GAT-3 (SLC6A11) from human, mouse and rat. Validated for ELISA, IHC and WB. SLC6A11 / GAT-3 antibody was raised against a 15 AA synthetic peptide near the carboxy terminus of rat GAT3 (3). The peptide was synthesized with an added cysteine amino terminal and conjugated to KLH. Recognizes rat GAT3 without significant homology to any other known eukaryotic protein. Species sequence homology: Mouse-100%, human-92%. Suitable for use in ELISA, Western Blot and Immunohistochemistry. Western Blot: 1-10 ug/ml using Chemiluminescence technique. We recommend the use of 0.5-1% milk in all primary/secondary antibody-enzyme conjugate incubations in order to suppress non-specific bands. ELISA: 0.5-1 ug/ml. 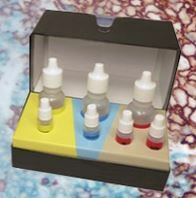 Control peptide can be used to coat plates at 1 ug/ml. Immunohistochemistry: 2-10 ug/ml in paraformaldehyde fixed sections of tissues.